File this relic from 1975 under “historical curiosity.” Walter Hill was already an established screenwriter (Peckinpah’s The Getaway, a pair of Paul Newman features, The Mackintosh Man & The Drowning Pool, among others) by the time he made his directorial debut with Hard Times. He would go on to amass a list of impressive credits, including co-producing every Alien movie, from the 1979 original right up to 2012’s Prometheus. 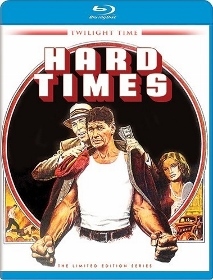 Due to Hill’s prominence, Twilight Time’s recent limited Blu-ray edition of Hard Times (only 3,000 copies available) is certainly worthwhile. The dual above-the-title billing of Hollywood legends Charles Bronson and James Coburn only adds to the value. But how does this Depression-era ode to bare-knuckle boxing hold up 38 years later? Not great, truth be told. Hill evokes the period well, or rather the period as we’ve come to expect it based on other movies (it looks and feels a lot like The Sting). But the whole thing is so overwhelmingly bland it doesn’t make any kind of impact. Bronson scores points by underplaying as Chaney, the gentle brute who shows up out of nowhere and starts knocking guys out to earn cash. Coburn hustles convincingly as Chaney’s fast-talking, gambling-addicted manager, Speed. The fights are staged realistically, especially those involving the punishing local champ, Jim Henry (Robert Tessier). But in the end, this hard-boiled drama is just a B-movie with excellent production values. Incidentally, I wonder if Sylvester Stallone perhaps drew inspiration from this when making his own directorial debut a few years later with Paradise Alley. Though that 1978 film swaps Hard Times’ bare-knuckle boxing for wrestling, both share a similar ambiance (Hill’s film is vastly superior). Hard Times looks great on Blu-ray, with a clean, sharp transfer that retains the natural graininess of the era in which it was produced. Colors are warm, though intentionally faded. Twilight Time licensed this from Sony-Columbia and it’s hard to imagine a better visual presentation. The DTS-HD MA 5.1 audio mix is, frankly, overkill for a modest, dialogue-driven film. That said it’s a fine soundtrack, free of distortion and presenting no issues. 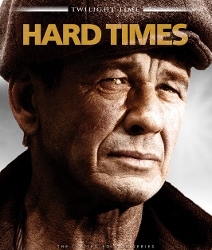 As always with Twilight Time titles, Hard Times features an isolated score track as a supplement. Barry De Vorzon’s music can be studied on its own via the DTS-HD MA 2.0 track. Julie Kirgo provides liner notes in the Blu-ray booklet, another standard feature of Twilight Time’s releases. For ordering info, visit Screen Archives.